T.I.’s contemporary fashion brand AKOO Clothing announces their second televised fashion showcase of the year. 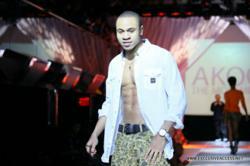 AKOO’s critically acclaimed 2012 Spring/Summer men’s collection will be featured during BET’s Rip the Runway on March 21, 2012 (10:00 PM, ET) on BET. The brand dominates the show’s theme "Music, Fashion, Freedom" by dazzling the audience with the au courant and distinctive looks of the collection. Held at New York City’s historic Hammerstein Ballroom, the private affair is hosted by Pooch Hall of BET's hit show The Game and Victoria Secret "Angel" Selita Ebanks with musical guest Wale, Meek Mill, Jeremih, Diggy, B.o.B and more. Described as one of the best dressed hours on television, BET’s Rip the Runway is one of the most talked about fashion experiences each year among distinguished fashion aficionados. In celebration of this great event, AKOO Clothing is giving fans a chance to win the entire 2012 Spring/Summer collection by visiting http://www.facebook.com/akooclothing on March 21, 2012 at (11:00pm ET) immediately following BET’s Rip the Runway. Fans will also get to watch a special rebroadcast of the AKOO Runway Show which aired on the season finale of TI and Tiny: The Family Hustle. “The inspiration evolves from the playgrounds of Harlem and expands to neighborhoods throughout America. The art direction showcases nostalgic underground sports fused with classic Americana imagery. It recounts memories of street heroes, team spirit and summer love. The collection is fresh, gritty, emotional and delivers a product assortment that any man can wear," stated Jeff Belizaire, Director of Marketing & Public Relations, AKOO Clothing. AKOO, an acronym for A KING OF ONESELF, is a men’s contemporary clothing line that exudes a unique sense of elusive style that is versatile to one’s own lifestyle. AKOO, was founded by Grammy award winning artist, music and film producer, song writer and actor, T.I., and his business partner and Grand Hustle Entertainment CEO, Jason Geter.